Huge new water tank completed at Mitamysi! 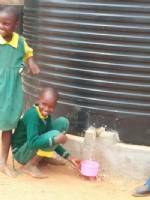 Mitamysi Secondary School now has a completed 150,000 Litre water tank, courtesy of African Sand Dams Foundation. This was facilitated by the UK charity Just a Drop where Lissa Campbell a TAS trustee works. The parents and community made a massive contribution to this huge tank which is expected to fill from water captured from the rooves of 2 classroom blocks. This should be sufficient to supply water to the students all year round. it may also be enough to do some watering of trees in the compound.